Meet Skype. Skype, meet everyone. My daughter and I now Skype. And it's like she never left home. Although this is not a photo of my daughter and I Skyping. 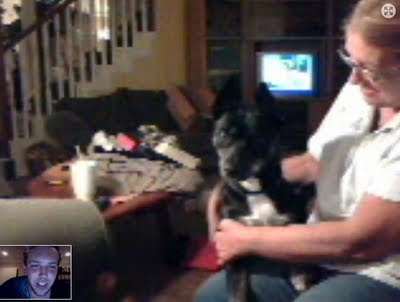 Nope, this is Jesse, my daughter's former boyfriend, skyping with his mom... and his dog. Yes, the dog skypes. Our skyping is pretty normal... and boring... so it's no wonder that this one struck me as funny. I wonder if my dog can skype. Or skip. Or type. Or do anything besides sleep. Nah. It's just not possible.